You must make reservations at least 5 minutes in advance of the time at Dyllan's Raw Bar Grill. Several Colonial lots in the area as well as in the building at 1054 31st NW Washington, DC 20007 Georgetown. Metered street parking available. Nearest: Foggy Bottom Metro on the Orange/Blue lines. Dyllan’s ‪Raw Bar Grill-Georgetown is perfect for any occasion, whether you want to stop at the bar for a drink and light meal, are looking for an exceptional brunch or dinner location, or celebrating your special occasion in our private event space. 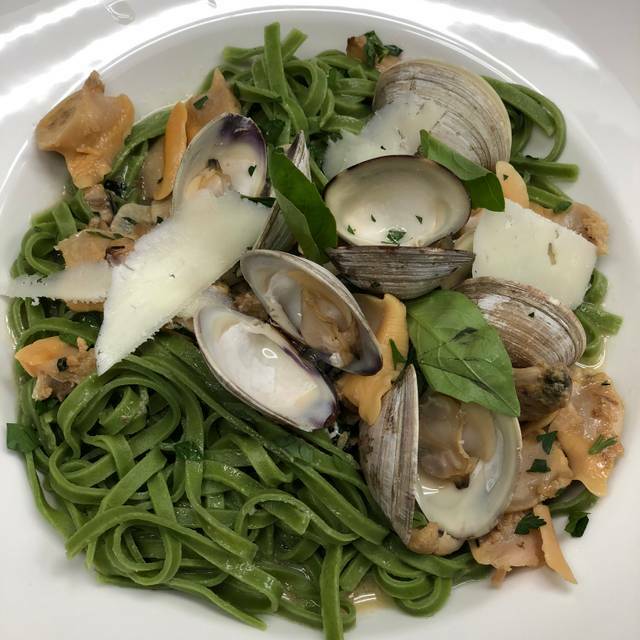 Our regional American cuisine features a modern raw bar, as well as a grill menu highlighting fresh seafood, steaks, and vegetarian dishes crafted with the finest ingredients. The restaurant—housed in a circa-1890s warehouse built from locally quarried stone and exposed Virginia “iron wood” heart pine timbers—is modern while celebrating the building’s industrial past. The restaurant’s outdoor seating overlooks the historic and picturesque C & O Canal. Here at Dyllan’s, we pride ourselves on working with local purveyors and artisans that adhere to rigorous sustainable standards. Close Proximity to Georgetown U, George Washington U, Horward U and American. Enjoy Food and Beverage Specials. Off Menu items 4pm-6pm Monday through Friday! Hola! Join Dyllan's Raw Bar Grill-Georgetown for Fish Tacos, Ceviches and Margarita specials all day. Two outdoor seating areas overlooking the C&O canal or in historic Canal Square. In addition Every Saturday and Sunday we offer $35 bottomless bellinis and mimosas. Make your reservation today! Join Dyllan's Raw Bar Grill to celebrate Mom. Dyllan's Raw Bar Grill in Georgetown is the perfect place for you mother's day brunch or dinner. Large groups welcome. Mother's Day specials and our bottomless cold pressed bellinis and mimosas. Service good and food was wonderful. Our group had a good time. Remember ambiance from previous visit. Love the stone walls and canal. Another perfect meal at this GT hotspot. Still quieter then I expected but this place is special. The seafood is so fresh and the service is above what is normal in DC. I would book your reservation now because I think this place is going to get really popular. This place is so beautiful and the outdoor seating is best I have seen in Georgetown or DC. You sit right on the C&O canal! I actually saw fish in the canal. In addition the managers and staff are super friendly. The manager said they opened like 6 months ago. Where have I been? Go here if you are anywhere near GT. Seriously for a DC restaurant only open 6 months this place is great. Fresh ceviches, maki rolls and oysters! I also shared the Arctic Char with this crazy salsa and the avocado mac & cheese was awesome!! Drinks were really boozy, cool spirits but not much name brand stuff which was fine for me. They told me there brunch is also very good so I'm already booking. I would make a reservation now because once this place gets found good luck getting in, especially on a weekend. This place needs better PR or a WP review. I can't believe it took 6 months to find. Great job Dyllan whoever you are! The atmosphere is cute and the people were friendly. But the service was terrible. We asked for bread when we were seated. No bread came so we ordered appetizers and our meal. Those took a long time to come out. Our waiter was not around very much. We asked for bread again twice during the meal. Finally when we were done eating and about to ask for the check the bread came out - it was basically toasted sliced bread. The food was mediocre and since we were seated outside, it became pretty cold as it got later. It ended up being an uncomfortable, frustrating experience. This was a special dinner for visiting family in town for the weekend. Everything was great. Food was wonderful and the atmosphere was relaxed and comfortable. We never felt rushed and were able to enjoy a long evening talking and catching up over delicious meals and desserts. Highly recommend! Sat down and ordered a cocktail, raw bar, and entrees. 20 minutes for the drink. 40ish minutes for raw bar. Came back around 50 minutes to tell us they were out of the entree we ordered. Then they were out of the second choice. Went with a third. Another 15 minutes go by. They were out of the third. Went with the fourth because after nearly an hr and a half we were starving and it was late. Total incompetence by the mgmt, and staff blatantly hung out more than they cared to hustle or see to our satisfaction (we weren't satisfied). They comped a dish, and the gesture was appreciated, but still wasn't enough to feel like it balanced the experience out, especially for the needlessly overpriced menu to begin with. Only reason it's not one-star is because the quality of the food was decent. Won't come back, won't recommend anyone go here. We were a party of eight. The waiter brought seven dinners and claimed the last one was on its way. It wasn't. Everyone just about finished eating when the last dinner finally arrived- which was a mushroom quinoa salad. During the waiting period, we inquired 3-4 times about the missing meal. Finally we had to ask that the meal be comp'ed. They agreed. Then as if that weren't enough, we ordered four coffees, and three desserts and they NEVER brought the third dessert in spite of us asking about its whereabouts three times. First they brought two desserts, then some time later brought the coffees and then NEVER brought the third one to the table. The food was good. The service crappy. Restaurant really loud. Will not return. Amoles-I am aware of this issue. Please accept my apology. This should have been handled by a manager in a much better way. I was made aware after you left. Please now that this is not acceptable. We strive to give every guest a 5 star experience and we clearly missed the mark. We are aware you chose to not leave a gratuity of any kind for the service and that is your prerogative. I would like to offer you dinner as my guest. This is my third visit and the food never disappoints. Oysters, Tinned Fish and terrific brunch entres. We view this as a GO to place in Georgetown. They could use an extra bartender during the day, as drinks were slow to come out. But were delicious, so worth the wait. Great dining spot in Georgetown with a BEAUTIFUL PATIO and a smaller Front Yard too, perfect for these days with nicer weather. Seafood is super fresh and guaranteed to please everyone from the sushi lovers to those who are more for the good authentic dishes, the squid carpaccio and the clams pasta are delicious. Food was excellent. Raw oysters were perfect. I had the prix fixe menu which included an amazing mushroom/cheese tart, fish cooked to perfection, and an amazing dessert. We had a great experience - the staff were attentive and friendly. We will definitely be back the next time we're in DC. Great food! Cool space. The lighting needs to be tweaked a bit but will be extra cool when it gets warm out! The octopus carpaccio was amazing. Manager was attentive without being overbearing. Great stop along the canal! Food was good. Service was subpar. For all the waitstaff, things came out slow. Would give it a second chance. We went with a party of 7. We all ordered different entrees, we stuck to fish, so we could try as much a possible. The food was great we can't wait to go back to try the other dishes. When asked by our server if this was our first visit we said yes and she immediately launched into a long and totally unnecessary explanation of the menu which could have been avoided had she just asked if we had any questions. Having sat through that we ordered cocktails and my gin gibson arrived as gin gimlet on the rocks. So I explained to her that a gibson was served straight up only to have it replaced by a gimlet with no ice. I finally explained that I had ordered a gibson which is gin and cocktal onions. My third drink arrived and it was the same gimlet I had already been served twice before but with the addition of onions. Obviously she or the bartender or both had no idea what a gibson cocktail is. After all of this the dinner was an anticlimax. Only three grilled fish are offered on the dinner menu and two of them - salmon and arctic char - are very similar. We inquired about any specials but there were none. The not very exciting menu resulted in a not very exciting dinner. Hi, I went here for brunch on Saturday! It was awesome! 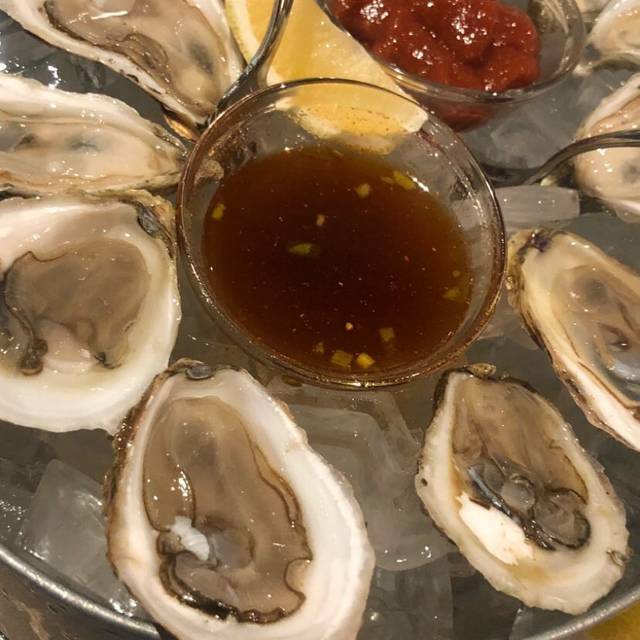 I loved the fresh east and west coast oysters. I also loved the avocado mac and cheese! 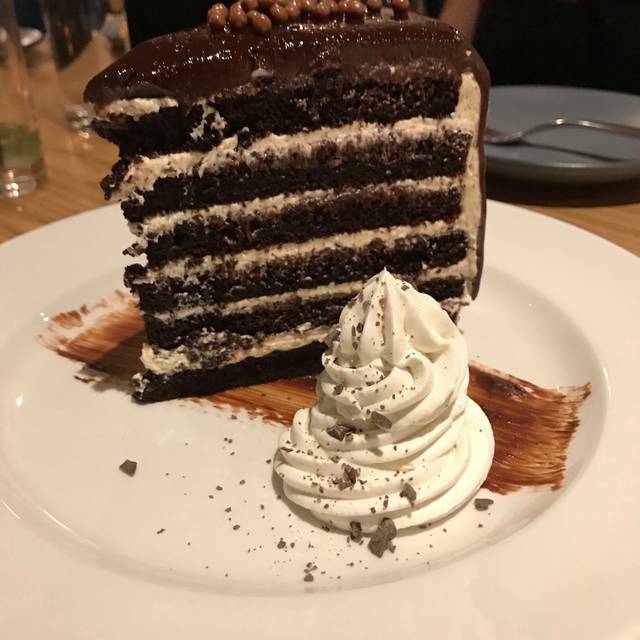 The chocolate cake was delish for dessert as well! I really enjoyed this restaurant I will be back soon! Awesome happy hour deals as well. Excellent place for fresh seafood. Plus have something for all (vegan, vegetarian, carnivores)! The desserts are scrumptious and the drinks are creative and delicious. Our new go-to spot! I was recently at Dillons for a business dinner. The location was perfect for us to discuss our proposal and enjoy a wonderful meal and excellent service. My business associates were also impressed with The restaurant. Dyllan’s never disappoints! My wife and I normally opt to avoid the craziness of going out on Valentine’s day, but the set Valentine’s menu that Dyllan’s created lured out out of the house this year. Am I ever glad it did! We’ve tried Dyllan’s several times and the food continues to impress me with its creativity, execution, and consistency. My wife had the seafood risotto while I opted for the sea scallops. Both dishes were amazing! I’m always impressed with how fresh the seafood is at Dyllan’s as well as the generous portions! The chef doesn’t skimp and treats the ingredients with respect letting them shine on their own merits while at the same time creating combinations that just exceed expectations. Beyond the impressive food, the ambiance of the restaurant made for a great and romantic experience. We had a table next to the fireplace in the quaint barside of the restaurant - super cozy and romantic. The great food, good ambiance, and friendly staff made for a perfect date night out! Thanks Dyllan’s for another memorable experience! I thought the service and the welcome was great but where the issue lies is the food and value for the product. I understand the concept and what they are trying to do. It just doesn't work. And when it all comes down to it the food quality was very poor. I hope that they read these thing not to be upset but to focus and re-align to what is important. Hopefully someone will recommend to me to try it again. Because every one deserves a second chance. Good luck! Place was empty when we arrived around 7 on a Wednesday (actually thought it might be closed before we got inside) and only 3 tables taken by the time we left. Waiter was nice but service was confused and slow despite there being nobody else there. Food was average at best. Would not recommend. Milo1512-Thank you for your review. We are sorry you were disappointed. As a newer restaurant we are still building our clientele particularly mid-week. It was very slow the day before Valentines Day. We work hard to provide a 5 star experience for our guests and our food gets very good reviews so it is concerning that you only gave us 1 star overall. There is also no excuse for slow or poor service. We will take your comments back to our manager and staff and review the evening. The waiter was inexperienced and overwhelmed. The service was EXTREMELY slow and the manager couldn’t have cared less. The manager could have righted his wrong, instead she was really the problem. The food was okay. But didn’t make up for the poor service. No wonder the restaurant was empty. What a lovely find!! Darryl's is now our go-to seafood place. Fresh fish and shellfish and not overlooked. Plus excellent chicken and gumbo--delicious food for all of your picky eaters! One of the most enjoyable lunch experiences in recent memory. Extremely creative menu - strongly recommend ordered 3-4 items from the raw bar and sharing. Nice ambiance. Very pleasant service. Can’t wait to come back. Thank you. Brunch was delicious. Food was a little pricy but it’s Georgetown. I will definitely go back, their full menu looked really good. Great food and service but we were really cold and no one on staff seemed to care or offered to move us to another table since the restaurant was empty. The waiters are super slow. I went for happy hour and it took 45 minutes for the bartender to even come over, and by that point happy hour was over. There were only 3 people in the entire place so I have no idea what the staff was even so busy with. This place has kinda weird lonely vibes and is super overpriced. Would not recommend for a happy hour unless you want to drink alone and not be seen. Great lunch and dinner spot! Love the location (on the canal in G'town) and space has been freshened up from the old SeaCatch decor. Food is tasty with updated twists. Love the mushroom salad! I write about top restaurants and chefs for a living. I can unequivocally say this was the worst service we've ever experienced in DC since I can remember. Drinks took 30 to 40 minutes, were forgotten and had to be re-ordered. At the start, 3 of the 4 appetizers we ordered arrived together, leaving one of us without oysters (the easiest and quickest of the four starters) -- for a solid 15 minutes while the other starters got cold. Dirty dishes sat at our table for 15 minutes before being picked up. 30 minutes later the entrees came with the wrong sides. They comp'd the oysters given the original delay, but not the drinks, and not the sides they got wrong -- a nice gesture, but certainly didn't make up for the evening. For those prices you expect a level of service, attention and quality, and Dyllan's missed the mark by leaps and bounds. We will not be going back given just how many restaurants in DC now offer much more for far less. 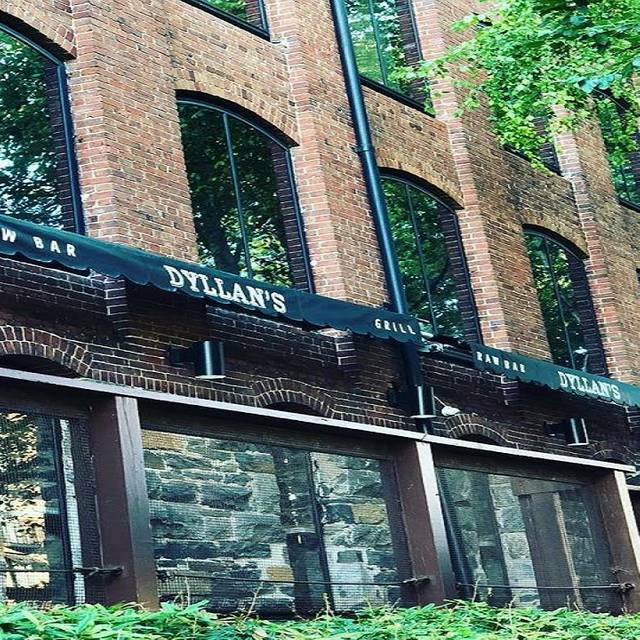 Dyllan's is next to a courtyard that's a ways off of a street in Georgetown and it has a nice secluded, cozy vibe to it - like you're being let in on a secret. The restaurant is also next to the canal and I am very much looking forward to returning when it is warm enough to sit outside next to the water. I had steak the first time I went and stuck to the raw bar the second time. The steak was great, but I'd definitely say don't miss the raw bar. Both the salmon and tuna tartares are unexpected in a good way, the sushi is fresh and firm, the tinned fish has a clean Mediterranean flavor, and the oysters are bright ad flavorful. I would definitely say the service goes above and beyond and the staff was extremely friendly and very knowledgeable. The prices are fairly expensive but this is a special date night spot. You pay a premium price and get a premium product. I am looking forward to my next trip to Dyllan's - I have my eye on their dry aged burger or their octopus carpaccio. Food was EXCELLENT! Definitely try the avocado Mac n cheese! Was excited to try the new seafood place that we ventured out of the way to Georgetown, where we very rarely go anymore. Was eerily quiet for a Friday night (but was during government shutdown so that may explain it), staff was friendly but all seemed green. Everything we ordered sounded amazing but was all quite under seasoned - most notably the saffron scallops- while they were perfectly cooked, the suave had no flavor at all. Pretty disappointing. Excellent service and well prepared food. All meals from appetizers, entree and dessert were a delight for the entire party. Excellent portions- a surprise since this was off the restaurant week menu. I would highly recommend to friends and family.